Jean Wooler, mother of GBIM missionary Barbara Wooler. Jean (Craig) Wooler – 81, of New Holland, Penna., formerly of Fayetteville, Penna., went home to be with her Lord on Sunday, February 6, 2011, at Garden Spot Village in New Holland. 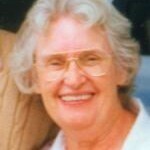 She was the loving wife for 61 years to Howard William Wooler. She was born in Philadelphia, Penna., to the late David and Beatrice (Cassel) Craig. Jean graduated from Olney High School in Philadelphia, class of 1947. She was a devoted mother and grandmother. Jean volunteered much of her time in the “Released Time” Bible class in the Fayetteville, Penna., area. She enjoyed crocheting, traveling to Florida with her husband during the winters and spending time with her family, grandchildren and friends. Jean was in fellowship at North Ridge Bible Chapel of Sellersville, Penna. In addition to her husband, Howard, she is survived by William Wooler (Son) & wife, Gina of Quakertown, PA; Charles Wooler (Son) & wife, Holly of Honduras; David Wooler (Son) & wife, Cathy of Souderton, PA; Barbara Wooler (Daughter) of Winona Lake, IN; and 10 grandchildren. She was preceded in death by a brother, Paul Craig. Viewings will be held at Anders Detweiler Funeral Home & Crematory on Friday, February 11 from 6-8 p.m. and on Saturday, February 12 at North Ridge Bible Chapel from 10 to 11 a.m.
Funeral services will be held Saturday at 11 a.m. at North Ridge Bible Chapel, 831 Keystone Drive, Sellersville, PA.
Burial will take place at Sunset Memorial Park in Feasterville, PA.
Memorial contributions may be made to: Christian Missions In Many Lands, Inc., P.O. Box 13, Spring Lake, NJ 07762 or Project Hope and Charité Orphan Ministry, P.O. Box 588, Winona Lake, IN 46590.